Upset on the lack of the 20th Anniversary Secret Rare. Hello Pojo Readers, Crunch$G back here to talk about another main booster set. This time is Cybernetic Horizon, which is honestly a good set… for casual players. Competitive players might take a pass on this unless one of the new archetypes becomes really good or they need a Borrelsword Dragon. Rituals made a return, and that is pretty cool. I won’t discuss too many details right now. Instead I’ll get right into the set. First off might be the most hyped archetype in the set, the Danger! archetype. The Danger! cards are simply based on revealing themselves in the hand and going back into hiding, then you make your opponent discard a card from your hand and if they did not select the revealed Danger! monster, you can summon said Danger! from your hand and draw a card. If they do discard the Danger! monster you revealed, or you end up just discarding a Danger! in general you get bonus effects. Bigfoot will destroy a face-up card, Nessie will search a Danger! card, Chupacabra will revive a Danger, and Jackalope will summon a Danger! from the deck in Defense. The archetype seems to have potential and is going to get more support, but there are also two Spell/Trap cards. Danger! Zone is the draw card of the archetype that lets you draw three and discard two, but if you don’t have a Danger! to discard, your hand goes into the deck instead. Realm of Danger! gives targeting protection to your Danger! monsters the turn they are summoned and can let one attack directly once per turn while that monster and the Field Spell are on the field. Danger! seems like a really good archetype to mix with other strategies until we get more support for a pure version. Get the Danger! cards when they are cheap. 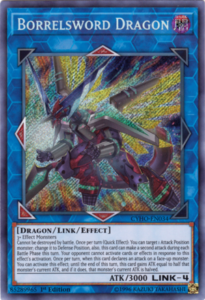 A cool part of this set is the return of the Cyber Dragon archetype with some great new support, including their own Link Monster. 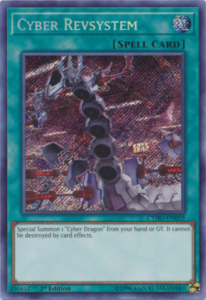 Cyber Dragon Sieger is the Link Monster the archetype could use with arrows that synergize with being in the Extra Monster Zone as well as being revived with Cyber Dragon Nova. Sieger will also boost a monster with 2100 ATK with another 2100 ATK and DEF in return of Sieger not being able to deal damage that turn, but this should still help you with the OTK. 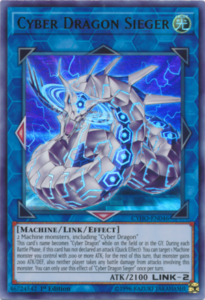 Cyber Dragon Herz is great for being another Machine Duplication in the deck to get to 2 Cyber Dragons as well as getting you to more Cyber Dragons, or a monster named Cyber Dragon in the GY, when Herz itself goes to the GY. Cyber Dragon Vier can come from the hand when a Cyber Dragon is summoned and then boost your Cyber Dragons by 500 ATK and DEF. Cyber Revsystem revives a Cyber Dragon and gives it protection from destruction effects. 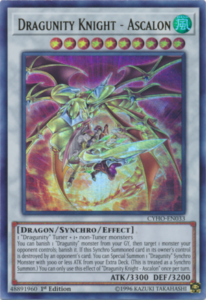 Finally, Cybernetic Overflow gives Cyber Dragons destruction by banishing your Cyber Dragons from the hand/field/GY with different levels and can also search a Cyber Spell/Trap upon its destruction. Cyber Dragons got some overall great support, and will be boosted even more with Legendary Duelists 3. 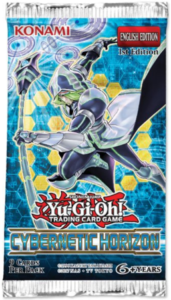 Noble Knights are finally getting some more TCG exclusive support after it all ended in Primal Origin. The new Rank 4 they got, King Custennin, can bounce cards your opponent controls to the hand based on the number of materials detached and can also summon a Noble Knight XYZ from your Extra Deck and use the King Custennin as material when King Custennin is destroyed. The regular Custennin can be Special Summoned from the hand while you control a Noble Arms card and can also give a Noble Knight Synchro, XYZ, or Link the effect to let you normal summon another Noble Knight. Pellinore gives you monster destruction in return for destroying a Noble Arms and then you can draw a card. Noble Arms – Clarent is the new Equip Spell that can let your monster equipped attack directly. Ok support, but I hope Soul Fusion gives us something along the lines of an A Hero Lives like card. Good ‘ol Demise and Ruin return with a whole archetype based on them. They got a ton of new cards, but for simplicity, I’ll only cover a few of them. First off is a bigger Demise and Ruin that upgrade the effects the smaller versions had. 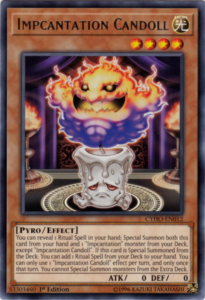 The Supreme King Demise lets you pay 2000 LP to destroy every card on the field as possible and burn for 200 per card destroyed, but you do not have to pay the 2000 if you used all Ritual Monsters for the Ritual and Demise also protects your Rituals from battle destruction. Supreme Queen Ruin can battle twice when you use all Rituals to summon it, can deal damage equal to the ATK of a monster destroyed in battle, and gives your Rituals protection from destruction effects. Also worth noting the upgraded Demise and Ruin are treated as the original Demise and Ruin while on the field or in the hand, and this also goes for baby Demise and Ruin. 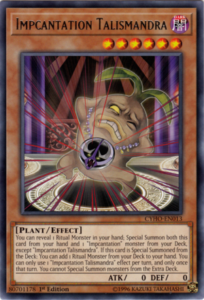 When baby Demise is summoned, you can destroy a face-up card on the field and if it is sent to the GY, you can give a Ritual Monster you control the ability to not have its effects be able to be responded to. Baby Ruin can attack twice the turn it is Ritual Summoned and when sent to the GY, it gives a Ritual you control an effect where your opponent cannot respond with anything while that Ritual battles. The final cards I will talk about are two new Spells to Ritual Summon. 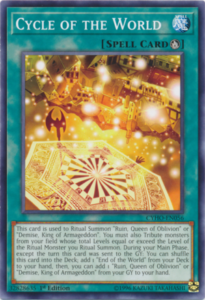 The first one, Cycle of the World, lets you Ritual Summon a Demise or Ruin using only monsters on the field, but it can exceed the levels of the Ritual Monster you intend to summon and Cycle of the World can also go back to the deck to search for End of the World and you can also get back the original Demise or Ruin from the GY. Turning of the World is a Quick-Play Spell that can Ritual Summon a Demise or Ruin from your hand or deck (you cannot summon the smaller/bigger Demise or Ruin from the deck) by tributing Ritual Monsters from the hand whose total Levels equal or exceed the Demise or Ruin. There are several other support cards, but this part is getting long and those cards aren’t really mandatory in playing this deck, the support is good, but sadly no holos in the archetype in this set, only the big Demise and Ruin are rares. Would of loved Super Rares at least. Dragunity support returns out of nowhere really, but if you think this is out of nowhere, next set has random Thunder Dragon support, but I’ll talk about that when we get there. Draguinties got a new Phalanix-like card in Dragunity Couse that can summon itself while equipped and be treated as a Level 4 for a Synchro Summon, but you can only use it to Synchro Summon a Dragunity. Dragunity Senatus lets you discard a Dragunity to equip a Dragunity Tuner from the deck in exchange to being locked into Dragons from the Extra Deck for the remainder of the turn. 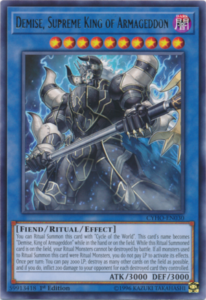 Dragunity Knight – Luin is basically another Vajyrayana for the deck, only it is a Tuner Monster so it cannot be used with another Dragunity Tuner like Couse or Phalanix, but has its potential uses. Finally, we got Dragunity Knight – Ascalon who lets you banish a Dragunity from the GY to banish a card your opponent controls and when Ascalon leaves the field, you can summon a Dragunity Synchro from the Extra Deck (treated as a Synchro Summon) with 3000 or less ATK, there is no Dragunity Synchro with 3000 ATK, but future proofing here I guess. 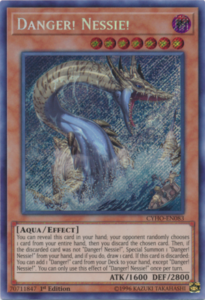 Dragunity Legion is a trap card the deck got that basically makes all your Dragunities either a Dux or Phalanx, but it isn’t that great really. Nice to see Dragunities get love in 2018. The Crusadia is the next archetype in the World Legacy story, and it is very interesting. The main deck monsters can summon themselves to zones a Link Monster points to and they all have various effects to either generate advantage or help you deal more damage. The Crusadia Link Monsters are supposed to help you get your big monster push off. 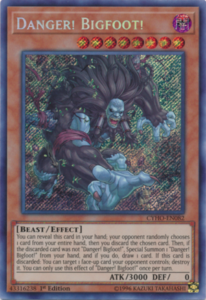 The Link-1 searches for a Crusadia monster, the Link-2 searches for a Crusadia Spell or Trap, and the Link-3 tributes a monster to negate a face-up card’s effects. It is worth noting the Link Monsters gain ATK equal to the ATK of monsters they point to but the monsters they point to cannot attack. The deck has easy combos to potentially OTK the opponent outright, just need the right hand setup. Pretty solid archetype overall, fun to mess around with. Cyberse got some ok support in this set and some of those cards are worth going over. SIMM Tablir can summon itself to a zone a Link Monster points to and return a Level 4 or lower Cyberse from the GY to your hand. Cyberse Witch lets you search for Cynet Ritual and a Cyberse Ritual Monster by banishing a Spell from the GY when a monster is summoned to a Zone she points to and can also revive a Level 4 or lower Cyberse if you used the previous effect in the same turn. Cynet Ritual summons your Cyberse Ritual Monsters and can banish itself and a Ritual from the GY to summon two Tokens. Now with the Cyberse Ritual support comes the Rituals. 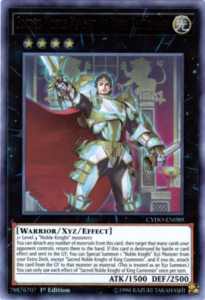 Paladin of Storm Dragon returns a monster it battles to the hand and can tribute itself to summon any Level 5 or higher Cyberse monster as long as that monster cannot attack that turn. 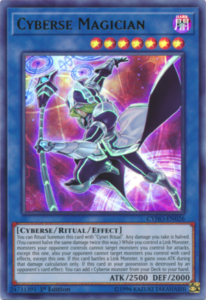 The main Cyberse Ritual though is Cyberse Magician who halves all damage you take, makes it be the only target possible for an attack or card effect while you control a Link Monster, gains 1000 ATK when it battles a Link Monster, and searches a Cyberse Monster when it is destroyed by an opponent’s card effect. 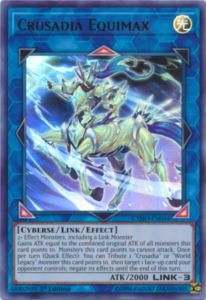 Fun support for the Cyberse archetype, and next set they’ll incorporate Fusion Monsters. After talking about all those archetypes, it is time to get into the other cards in this set to end this off. Gouki got some more monsters, but the main deck monsters don’t search like the previous Gouki monsters do. The most noteworthy Gouki is Moonsault, who lets you bounce a Gouki to summon itself from the hand. Rituals got some nice support cards in the Impcantation cards that let you reveal a Ritual Monster/Spell to summon itself from the hand and a different Impcantation from the deck, and the other Impcantation from the deck will likely search for the opposite of what you revealed. Metaphys got a really good Pendulum Monster and Trap Card that really make the deck more consistent and overall better. DARK finally got an Elemental Lord. Cosmo Brain is great for the Dark Magician deck. Mana Dragon Zirnitron is great for decks that really rely on a specific Spell or Trap card. Mekk-Knights and Sky Strikers got a new Link Monster each. The LIGHT and DARK attributes also finally got their own Link Monsters to finish the attribute set. World Legacy Survivor is great for the Krawler archetype and maybe future World Legacy archetypes as well. Level 6 monsters get their own good draw card since Levels 7 and 8 got them. Ledger of Legerdemain is honestly good for stun decks and has some potential in decks that can control the game long enough to get the cards you banished for Ledger. Pinpoint Landing is solid for decks that summon from the hand a lot, and finally Gladiator Beasts got their own Link Monster to make the newest Fusions somewhat better. Ok, I guess I’ll invest a whole section into the best card of the set, Borrelsword Dragon. Borrelsword is similar to Borreload when it comes to the summoning conditions, but the effects are far different from Borreload but are still almost as good as Borreload and in some cases, even better. Borrelsword has battle destruction protection where Borreload had the targeting protection. Borrelsword lets you target and change a monster to Defense Position from Attack Position during either player’s turn and your opponent cannot respond to that. Meant to trigger Rokkets but can also be used defensively. When Borrelsword battles, it gains ATK equal to half the ATK of the monster it is battling and that monster loses half its ATK, this is once per turn so attack the strongest monster first. I say first cause the turn you use the effect to change a monster’s battle position, it can attack again. This thing is an OTK machine and is a staple in any Extra Decks that considered Borreload a staple. The Borrels have some great boss Link Monsters… and Borrelguard. If you do want to buy this set competitively, it is probably because of Borrelsword. From a competitive standpoint, this is a very weak set. The Sky Striker Link might be great for a Super Rare, the Impcantation monsters might be great if another Ritual archetype becomes meta, Danger! seems to have potential even though we got to wait on more support before we can see if it can survive as its own deck and not mixed into other strategies, and Borrelsword is a beast. From a casual standpoint, again the Impcantations are great for Ritual strategies and they’ll get more cards in Soul Fusion thankfully. The many archetypes mentioned in this article are pretty cool, especially Cyber Dragons. As a casual player, this set might be worth buying for you maybe if you don’t want to just buy singles. From a competitive standpoint, you’ll probably just get your Borrelsword and maybe your Sky Striker Link and Danger! cards. The set isn’t bad, just it favors casual players more.